You already know perfect lawns begin with the improved grass seed varieties available on this website. The second step to turfgrass perfection is feeding your lawn. Kinder blend fertilizer helps achieve the maximum genetic potential of your grass seed by slowly feeding the plants over a two month period, producing a consistently green, slow growing lawn that requires less mowing. One of the worst things you can do to your lawn is feed it with urea based fertilizer. Applying urea fertilizer is the agronomic equivalent of feeding your lawn a supersized extra value meal. It fills you up, but we all know it's not healthy. Three things happen when you apply urea to your lawn, and none of them are good. First, in the presence of moisture some nitrogen is rapidly taken up through the plant roots in about 72 hours, resulting in a flush of growth and the production of extra grass clippings. Second, excess nitrogen can be washed down through the soil to contaminate groundwater below. Third, some nitrogen escapes into the atmosphere in the form of ammonia gas without providing any benefit to the turfgrass plants. The problem is that urea is the primary nitrogen source found in most retail lawn fertilizers. For example, the best selling turfgrass fertilizer sold in virtually every discount store and garden center in the country (32-4-8, with 2% iron) contains 19.5% urea, or about 60% of the total nitrogen in the bag. The reason is simple. Urea is a low cost nitrogen source for fertilizer manufacturers. "Uncompromised Quality" is the motto of SeedSuperStore. We believe homeowners should have access to the same high quality fertilizer used by many golf course superintendents to produce uniformly beautiful and healthy turfgrass throughout the growing season. The primary benefit of Kinder blend fertilizer comes from methylene urea, a nitrogen source that becomes available to the plant very slowly through the natural action of soil microbes. Instead of releasing nitrogen in 3 days like typical urea based retail fertilizer, Kinder blend fertilizer feeds your lawn slowly over a period of months, producing uniformly green grass without a surge of growth. Kinder blend Turf Maximizer (23-0-20 with 96% methylene urea) brings out the natural beauty of the improved turfgrass varieties we sell. Turf Maximizer feeds the plants slowly and steadily, producing uniform color throughout the season. 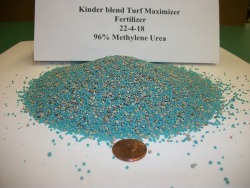 Kinder blend Starter Fertilizer (19-26-6 with 72% methylene urea) conforms to the industry standard starter fertilizer formulation with a 3-4-1 ratio of Nitrogen-Phosphorous-Potassium. Phosphorus is important because it promotes root growth in seedling plants. Experts recommend a total of 1.5 lbs of actual Phosphorus (P2O4) per 1,000 sq ft with a soil test at time of planting. 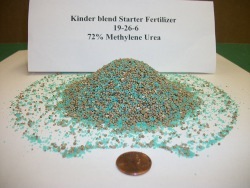 In addition Kinder blend Starter Fertilizer has a significantly higher proportion of slow release nitrogen (72%) than many other starter fertilizers. This is particularly important for slow germinating species such as bluegrass. The phosphorous and methylene urea in Kinder blend Starter Fertilizer remain relatively stationary in the root zone, whereas nitrogen from quick release urea found in many other starter fertilizers can wash through the soil well before the seeds germinate. 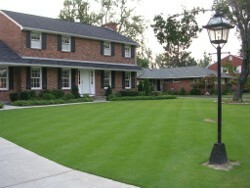 Kinder blend fertilizer brings the benefit of slow release golf course fertilizer to homeowners. Check out what is available in your local stores. You won't find anything close to the 96% methylene urea nitrogen source found in Kinder blend 23-0-20 Turf Maximizer. Kinder blend fertilizer works. Methylene urea is a time-tested and proven slow release nitrogen source. Since switching to methylene urea as my nitrogen source on my home lawn, I have been amazed at the overall beauty of the lawn without all the extra mowing I used to get from my previous retail fertilizer. Use Kinder blend Starter Fertilizer at time of planting at a rate of 5 lbs per 1,000 sq, ft. (Fertilizer will not harm seed and starter fertilizer should always be applied when planting new seed). During the first growing season I recommend four applications of Kinder blend fertilizer (Starter plus three applications of Turf Maximizer fertilizer) at a rate of 5 lbs per 1,000 sq feet. If your new lawn area is smaller than 5,000 sq feet, use up your starter fertilizer first and then switch to Kinder blend Turf Maximizer for the balance of your grow-in program. Apply at intervals of 6-8 weeks. After one grow-in season, switch to three applications of Kinder blend Turf Maximizer per year, applied on Memorial Day (May 30), Labor Day (September 1) and Columbus Day (October 12). You will be absolutely amazed at the results!